The history of Bandera’s own Frontier Times Museum is a story of one man’s dream that has become a legacy for an entire community. The Frontier Times Museum has often been referred to as the “jewel” of Bandera. 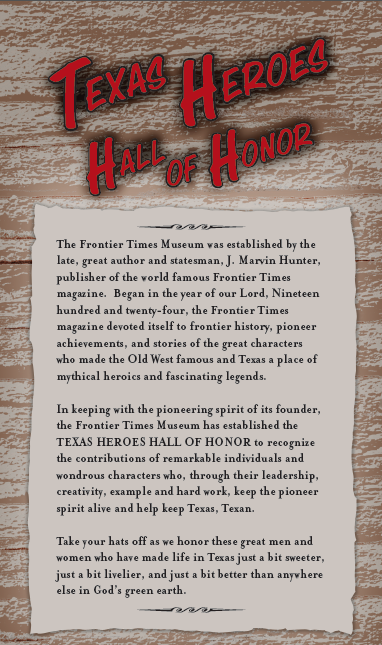 In keeping with the pioneering spirit of the museum’s founder, J. Marvin Hunter, Sr., the Frontier Times Museum has established the FRONTIER TIMES TEXAS HEROES HALL OF HONOR, to recognize the contributions of REMARKABLE INDIVIDUALS AND WONDEROUS CHARACTERS who, through their leadership, creativity, example and hard work, keep the pioneer spirit alive and HELP KEEP TEXAS, TEXAN. Each year, the museum inducts it’s honorees at an annual induction ceremony held in conjunction with the museum’s NATIONAL DAY of the AMERICAN COWBOY celebration on the fourth weekend of July in Bandera, Texas, the Cowboy Capital of the World.